Paleo Ki’che is an online social management game developed in partnership with Gameloft during a double intensive-week at Supinfogame. I worked on this project as Project Manager & Game Designer. 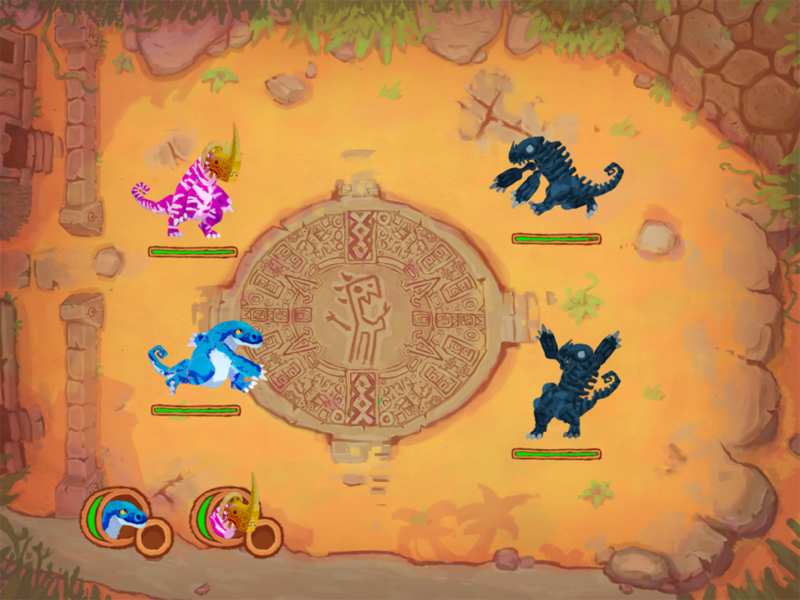 In Paleo Ki’che, the player is in charge of a tribe of dinosaurs on the edge of extinction. 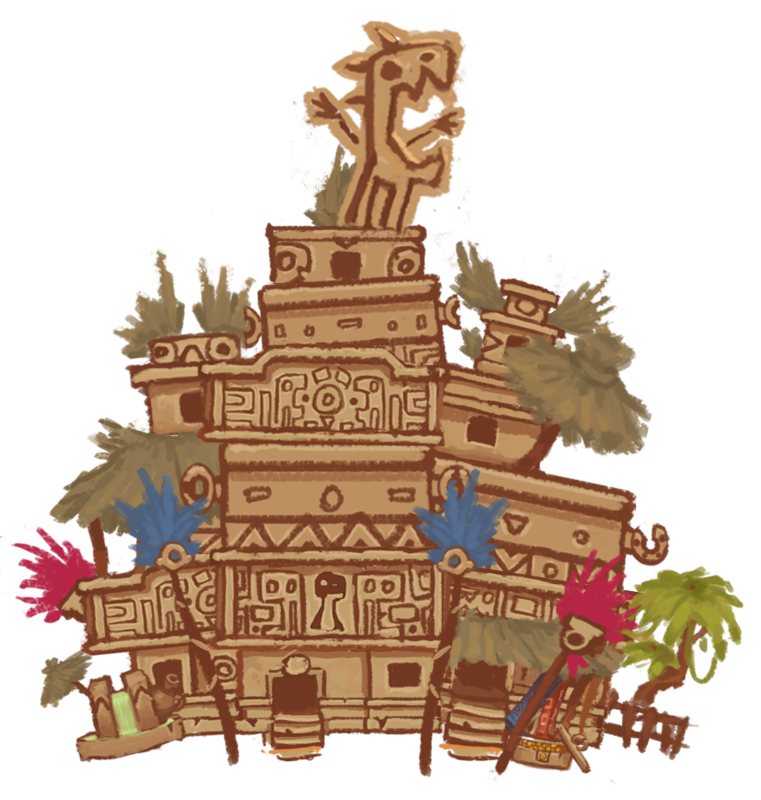 They must help them survive and develop their civilization through several interconnected mini-games. At first, our team was asked by Gameloft to make an « ethical free-to-play » for mobile platforms and to use an artistic direction inspired by pastels. After a brainstorming session, our team decided to go for a game inspired by Final Fantasy XII’s gambit system where the player had indirect control on a fighter team. In this concept, the player must coordinate a group of three fighters by defining their reactions on the battlefield before the confrontation. During the battle, the player could trigger specific event but not control directly his fighters. Then, our game artists got the idea of prehistorical universe where the player would train dinosaurs to defend a village from external assaults. This allowed them to adopt a rock-painting inspired artistic style which responded to our graphic constraints. Due to the short time we had to develop the prototype (two weeks), needed to efficiently communicate and represent the workflow. To do so, we adopted the Kanban methodology which uses billboard and colored post-its to visually represent all the different production tasks and their completion state. As a consequence, every team member in the room could easily visualize advances. Also, we practiced the daily-meeting inspired by the agile methodology in order ensure that all of the members were aware of the progress made the day before. After three days of development, we were asked to rework the concept so it fits a target audience of 25-45 years old women. We had to make big changes concerning the gameplay and the art which were too war-centered and aggressive. We made some researches about this demography and their expectations in terms of video games. Our conclusions were the following: women from 25 to 45 years old seemed to privilege creativity, communication and cooperation in games and wanted to feel empowered. Also, we noticed that a part of these women were not satisfied with games targeting their demography which they consider as lacking of depth and too « cliché » (using themes such as fashion, cooking…). With all this information, we decided to make a rework of the concept as an MMO mixing city-building, time management, breeding and tactical combat. Our intention was to satisfy our large and disparate audience through the variety of interconnected mini-games. 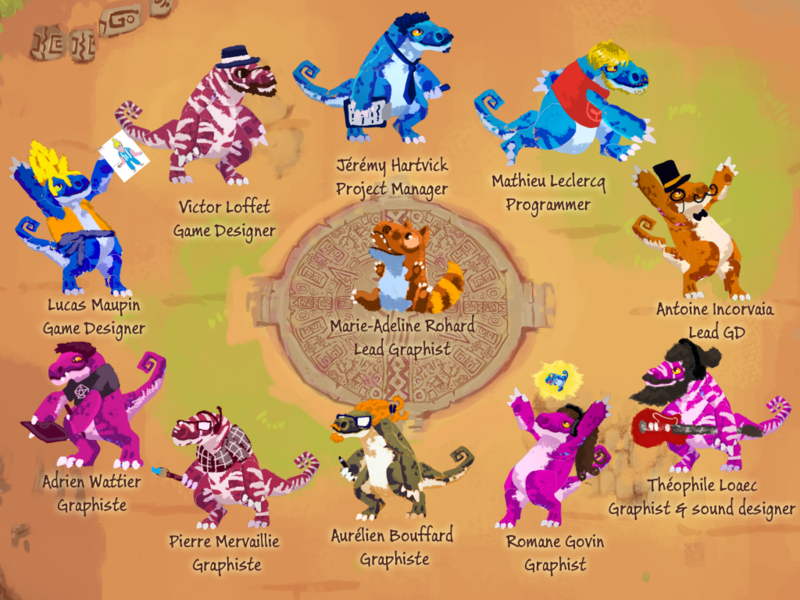 Each game give the player resources that they can use in another mini-game, but these resources can also be exchanged with other players online. 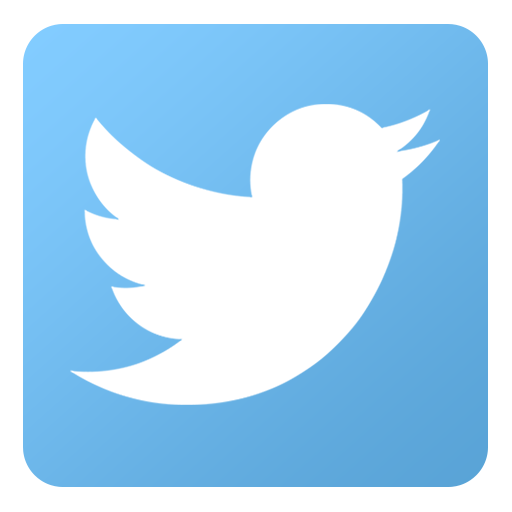 As a consequence, event though all mini-games are interconnected, each player can specialize themselves in only one aspect of the game if they desire so, and this pushes them to interact more with the online community, creating retention and virality. The first mini-game is based on breeding. 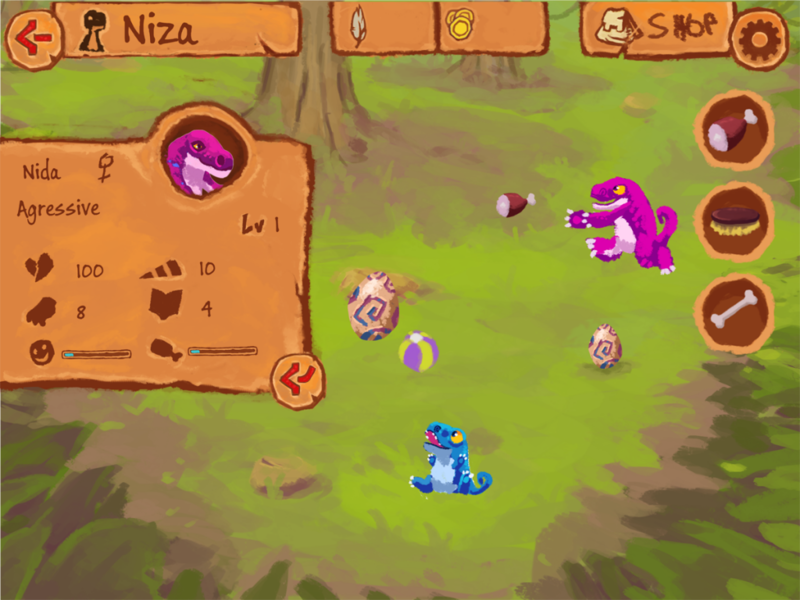 The player must train dinosaurs, feed them and play with them to boost their mood and improve their abilities. The player can also enhance their ranch to provide a better environment for the pets. Also they can make dinosaurs breed to get babies with with specific characteristics inherited from their parents. These pets can then be used in other mini-games to help reconstructing edifices, to defend the city or they can be exchanged or sold online to other players. 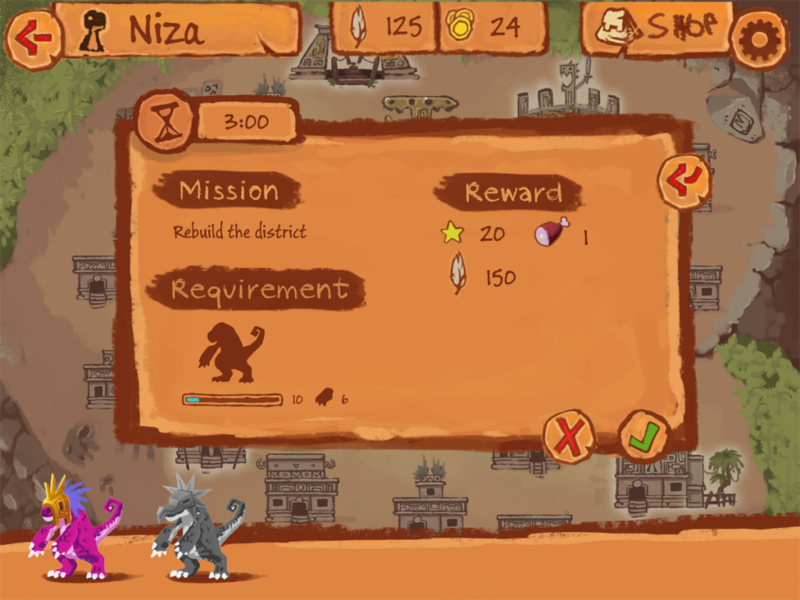 The second mini-game is a time management-based city-builder where the player can send dinosaurs to help rebuilding the city in exchange of resources, experience and progress in the storyline. Depending on the dinosaurs stats, the reconstruction will take a different time and will be more or less efficient. By restoring their own city (local), players contributes to improve their server’s empire (online) which provides bonuses to all. Also, some specific quests are directly linked to the server and requires that players unite their strength to rebuild « wonders » in the empire within a given deadline. The last mini-game consists in the fighting AIs which attack the city using the combat system introduced above. This game is divided in two mode. The first one is a story mode which allows the player to progress in a storyline. The second mode is an the defense mode where the player fights waves of enemies to defend their city and the server’s empire, preventing attackers from destroying buildings. This Gameloft-partnered project was the first time I have been given the opportunity to manage a team of more than ten people. As a consequence, I had make a really structured sever where all files where stored in different folders and must be named according to a nomenclature. Also, this was the first time I have been able to use Kanban methodology as project manager and helped me to improve my understanding of it. Furthermore, despite that changing our target audience was destabilizing at first, it was a great experience to help us being more adaptive and prepared to such situation in the future. Besides, the fact that we decided to analyze directly our target audience and not only the market trends allowed us to design a game which stands out from the concurrence and which aims at a portion of the audience which hasn’t been targeted before.